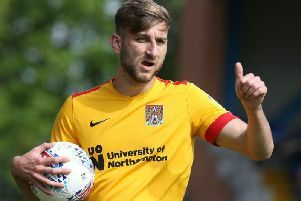 As disappointing and underwhelming as the Cobblers performance was in their 1-1 draw with Morecambe on Saturday, it turned out the point gained from a sub-standard encounter was a very handy one. Second-from-bottom Macclesfield's self implosion at Whaddon Road, where they threw away a 2-0 lead to lose 3-2 to Cheltenham Town, ensured the gap between the Cobblers and the relegation zone grew from six to seven points. And Town, who did drop to 17th in the Sky Bet League Two table, also have a game in hand on the Silkmen. The advantage over rock bottom Notts County is a whopping 13 points, so on the face of it, fears over relegation among the Cobblers support should be easing. It may be the ingrained pessimism of the Town faithful, of always fearing the worst, but this Cobblers team is still on course to be safe from the dreaded drop this season, even if it is more down to the inadequacies of others rather than their own abilities. But there were plenty of boos at the final whistle, and the anxiety remains, for a variety of reasons. Yes, the second half was terrible. Yes, the Cobblers were, in the end, lucky to claim a point thanks to a shocking miss late on from Shrimps substitute Liam Mandeville. And yes, it is hard to take positives from such an afternoon. But there were some in there, especially in an encouraging first half performance that should have seen Keith Curle's men, not for the first time this season, out of sight by the interval. Jack Bridge has excelled in the past couple of games in a central attacking midfield role, but was shifted out to left wing-back to cover the loss through injury of George Cox, and also to accommodate new boys Joe Powell and Timi Elsnik. If he wasn't happy with being played out of position, he didn't show it, as he was again the Cobblers best and most creative player, getting on the ball a lot and causing Morecambe plenty of headaches. Elsnik, signed on loan from Derby County on Friday, was another plus from a promising first half, picking the ball up and running at the opposition, and scoring as well with a thumping left foot finish. He faded after the break, but then he wasn't alone in that. Powell didn't enjoy such an accomplished debut, with the West Ham youngster looking slightly overawed by the occasion of his first Football League appearance. He never hid at any point, but struggled to come to terms with the physical aspects of the match, and also a playing surface that is not quite the billiard table he may be used to in Premier League academy football. But he will surely only get better now he knows exactly what to expect from the heat of a league two encounter. Town created enough chances in the first half to put the game to bed, but as has often been the case this season, they failed to take them, with Sam Hoskins the chief culprit. Playing up front alongside Junior Morias, the hard-running, energetic and ever-willing Hoskins caused Morecambe plenty of problems, but was found wanting when it really mattered as he fluffed his lines with at least three presentable chances. Shrimps goalkeeper Mark Halstead did make one good stop from Hoskins, but the diminutive front man failed to hit the target when well placed on a clutch of other occasions, the most glaring when he headed wide from inside the six-yard box. Boss Curle has continued to keep faith with Hoskins, who never fails to give his all, but the player simply has to start repaying that faith with goals, and soon. He has yet to score in the league this season, and has netted just twice in 30 games in all competitions, and that is not good enough. As has often happened this season, Town failed to build on a promising first half display, and what was produced after the interval was nowhere near up to scratch. Morecambe upped the tempo, and without doing anything clever or special, started to cause Town real problems as they dominated the midfield, leaving the back three exposed. They had already threatened before Richie Bennett equalised from close range, the goal set up by an unchecked run through the middle from Andrew Tutte, and a left-wing cross from the veteran Kevin Ellison. Town for their part, then completely lost their way. They became ragged and disorganised, and the pattern of play that had served them so well in the first half simply disappeared. Changes were made, but they had no real impact. There was still the odd Town attacking flurry, but it was Morecambe who looked the more likely, with Cornell saving well from Vadaine Oliver, who also had a goal chalked off for a tight offside call, before Mandeville, clean through and in the middle of the penalty area in the dying minutes, somehow sliced his shot five yards wide. That was a massive let-off. The bright spot of the second half was the late introduction of another academy graduate and teenager in Morgan Roberts, but that was a rare bit of sparkle in 45 minutes of gloomy fayre. The manager spoke afterwards of the attack needing a focal point, and he is right. With Andy Williams dropped to the bench, Morias worked his socks off as the targetman on Saturday, but that is not his natural game. Curle also spoke of needing experience in key positions, and again that is the case, with the central midfield area surely a prime concern. Jordan Turnbull did a solid job alongside 20-year-olds Elsnik and Powell at the weekend, but he is a central defender playing out of position, and if Sam Foley and John-Joe O'Toole aren't going to be fit any time soon, then somebody has to be signed this week ahead of the January transfer window closing on Thursday. So is it going to be a busy few days of ins and outs at the PTS? I think it may be, but be in no doubt, Curle is in no hurry and will not take any sort of gamble on any player. He is relaxed about the team's position in the league, even if others aren't, and is playing the long game. If he has to wait until the summer to get the players in that he really wants, and to discard others he doesn't, then that is what he will do. But he is well aware the current team has shortcomings, and I am pretty confident some of them will be addressed before the window shuts at 11pm on Thursday night.